Description: NS6091 leads a westbound freight into Hannibal. Description: A pair of former N&W SD40-2s handles southbound pigs at the north end of Crawford siding. Date of photo approximate. 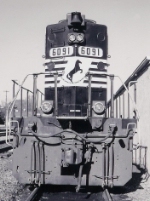 Description: Looking up and against the pilot of the 6091, a former N&W unit. Description: NS Northbound Local Freight Train A56 ( Meridian, Ms. to Birmingham, Al. ) passing through 32nd Street Interlocking in Birmingham, Al. Title: NS 6091 Setout and Pickup. Description: Setout and pickup in old IC yard.